With Premium/Advanced License options now available get on board today using this highly advanced and expanded release of the industry color separation for screen printers automated software first released as Spot Process back in 1995. Now with two distinct color separation engines to manage the broad range of files screen printers work with every day, and the addition of direct to inkjet film output with the print window features a screen printer needs, this outstanding Separation Studio 4 software ends so many of the struggles facing artists during file preparation, separation and output to film. 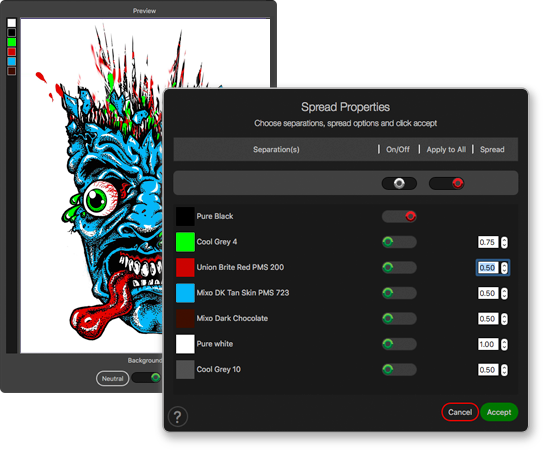 As a focused software with features specific to the needs of artists, producing work for screen print production has never been faster or easier. Separation Studio 4 was created for raster, vector and download art service images. Spot Process Sep Studio 4 (SPSS4) fits easily into your Corel and Adobe design world, built to bridge those industry gaps making easy work of complicated separation and output processes. BONUS: The All Black Ink™ (Multi-black) feature is included in the Print Commander of SPSS4 for a full year – $195 value! Spot Process Separation Studio 4™ color separates graphic images created in Adobe, Corel and other mainstream graphics software. File Size: separation, image preview and file output processing speed is related to the file size and resolution and cpu processor. SPSS4 provides default settings to maximize processing speed while maintaining the quality that meets screen print industry standards. With the first direct to inkjet print feature in the industry, Separation Studio 4 will color separate and print to film through supported inkjet devices separated files in Separation Studio 4. An outside RIP software is not required for Sep Studio 4 separations. We suggest users work with AccuRIP Black Pearl Software™ to have output control of files not separated through SPSS4. Separation Studio 4 software is a product you License for Use. With Two License Options for Spot Process Sep Studio 4™ you’ll want to pick what’s best for you. There are two options for New Users and two for existing users of earlier SPSS versions. Dynamic features, free updates and upgrades. Designed for users that expect to progress their hardware, OS, or software. Always work with the latest technology advancements. There is a yearly fee along with a matching coupon program. We give you back in coupons ($200 for Premium) and ($400 for Advanced). These coupons apply to non-software products available in this web store. Every 60 days a new set of coupons are provided. Fixed features, fixed cost, OS specific and free updates. For users that progress more slowly with hardware, Operating Systems, and software, and generally don’t opt for advancements as they are released. Your upfront, one time fee does not provide no cost software upgrades. Change your License Plan with the assistance of our sales team. Chat or email us. There are great benefits to both License options and we have the info to help you make an informed decision. The Term of the License is different under each option, as is the availability of features. Each License has a price reflective of the use and value to the software user. 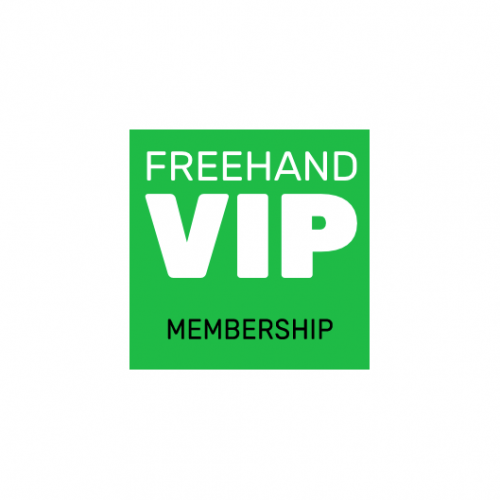 Each fall under Freehand’s software license guidelines governing the use and distribution of the software.